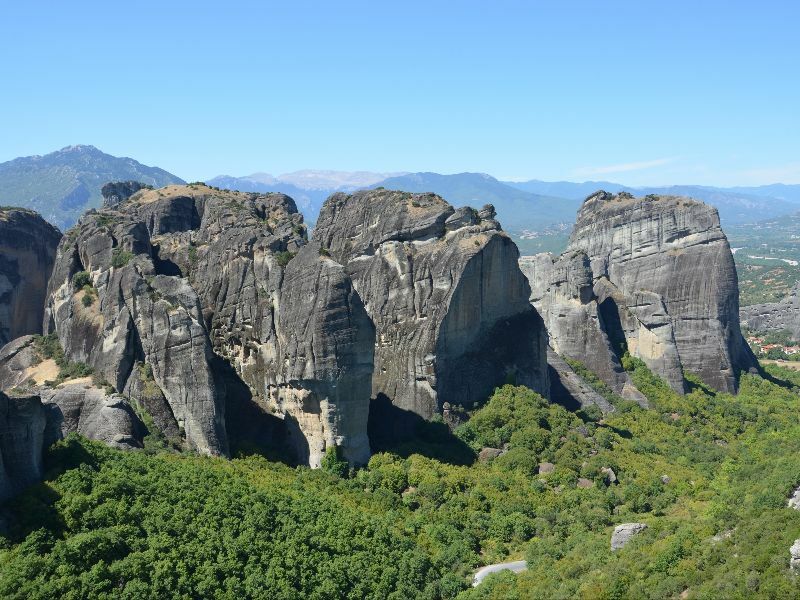 The wild and inaccessible landscape of Meteora became the “shelter” for the Christian ascetics who settled in the area, on a date that is not exactly known, but is estimated around 1100 AD. The steep cliffs, which appear to have come from the sky, are located near the first hills of Pindos and Hassia, above the towns of Kalambaka and Kastraki, in the Thessalian plain, in the center of mainland Greece. On the peaks of some of the rocks of Meteora, there are monasteries built, making the area the second most important monastic complex in Greece, after Mount Athos. At their peak in the sixteenth century there were 24 monasteries at Metéora but only six (the Mansions of the Transfiguration of the Savior, the Holy Trinity, St. Nicolas of Anapache and Varlaam, and the women’s monasteries of Rousanos and St. Stephen) are currently operating and included in the UNESCO World Heritage List. Meteora has been featured in the James Bond film "For Your Eyes Only" and in the Angelina Jolie film "Tomb Raider - Cradle of Life". If you ever find yourself in Meteora with fog, you will really think you are in another world. It is a landscape of unparalleled beauty that is worth visiting, whether you are lovers of natural and wild beauty, or are looking for peace and quiet. On the way from Kalambaka to Kastraki, a road leads to the monasteries of Agios Nikolaos of Bantova and Agios Antonios, which are built in the caves of the rocks. In Kalambaka, located in the “shadow” of the rocks, you will find many hotels (often overlooking the imposing rocks), but also restaurants, taverns and cafes. Do not forget to visit the newly renovated old town, where there is the only woodworking school in Greece. Above Kalambaka is the picturesque village of Kastraki, with its beautiful houses, mansions and narrow alleys. From Meteora and Kalambaka you can also easily visit the picturesque village of Elati, Pertouli with its ski center and the surrounding areas of Aspropotamos and Hassia. 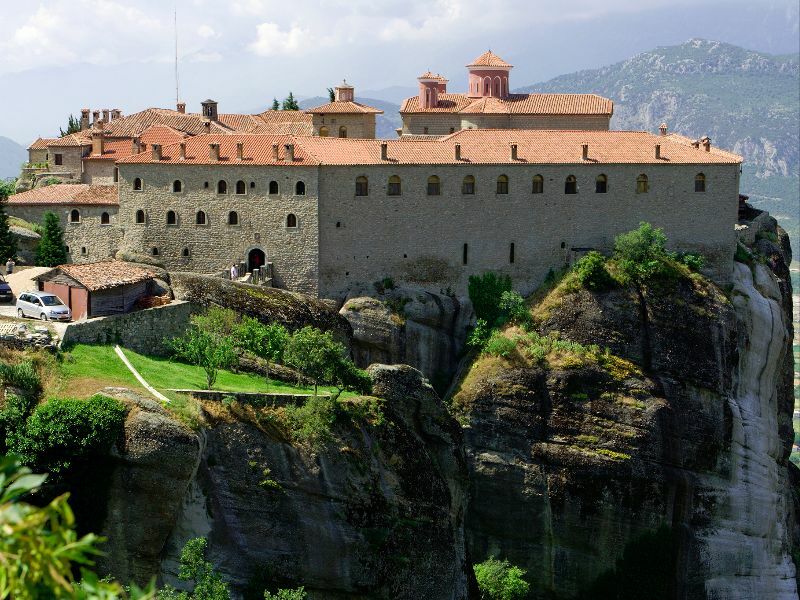 Meteora is 360 km from Athens and 230 km from Thessaloniki. The shortest route is from Domokos – Karditsa – Trikala. Kastraki is 3 km from Kalambaka. This is the largest of the monasteries located at Metéora, though in 2015 there were only 3 monks in residence. It was erected in the mid-14th century and was the subject of restoration and embellishment projects in 1483 and 1552. One building serves as the main museum for tourists. The Katholikon (main church), consecrated in honour of the Transfiguration of Jesus was erected in the middle of the 14th century and 1387/88 and decorated in 1483 and 1552. The Monastery of Varlaam is the second largest monastery in the Metéora complex, and in 2015 had the largest number of monks (seven) of the male monasteries. It was built in 1541 and embellished in 1548. A church, dedicated to All Saints, is in the Athonite type (cross-in-square with dome and choirs), with spacious exonarthex (lite) is surrounded by a dome. It was built in 1541/42 and decorated in 1548, while the exonarthex was decorated in 1566. The old refectory is used as a museum while north of the church is the parekklesion of the Three Bishops, built in 1627 and decorated in 1637. The Monastery of St. Nicholas Anapausas, built in the 16th century, has a small church, decorated by the noted Cretan painter Theophanis Strelitzas, in 1527. There was one monk in residence in 2015. Meteora, a 2012 Greek film devoted entirely to a story set in the Monastery of the Holy Trinity, Meteora. 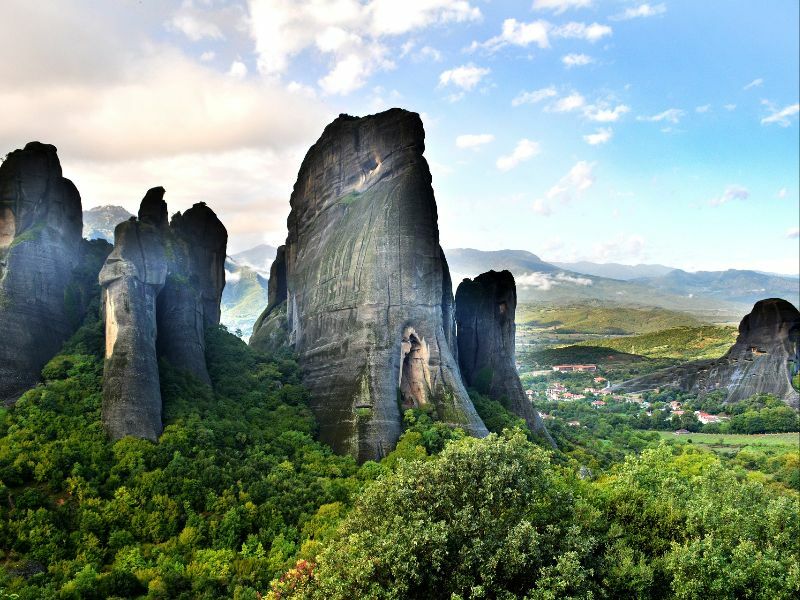 Scenes from Tintin and the Golden Fleece were also shot at the Meteora monasteries. 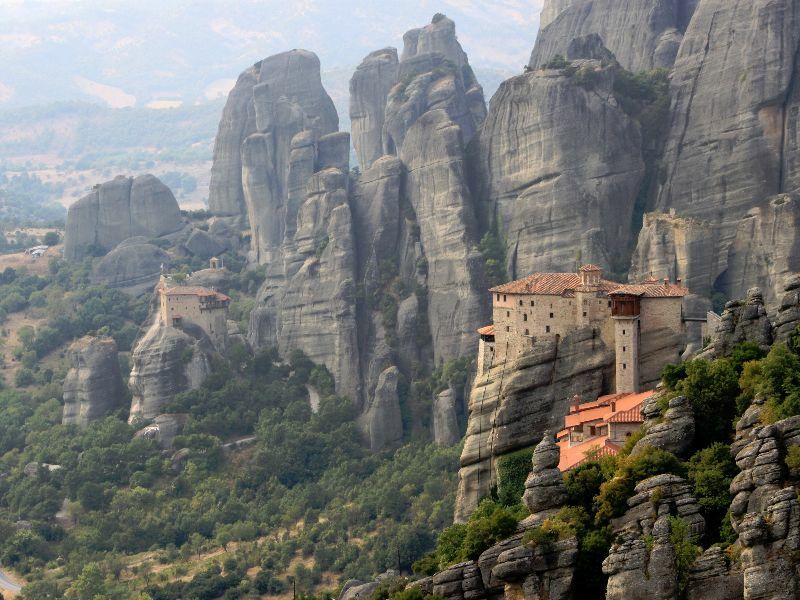 Michina, the main setting of the movie Pokémon: Arceus and the Jewel of Life is based on Meteora. The Holy Monastery of St. Nicholas Anapausas was an inspiration for the monastery of St. Francis Folly, in the first level of Greece in both games Tomb Raider and Tomb Raider: Anniversary. One of the surviving characters in Max Brooks‘s zombie apocalypse novel, “World War Z” finds refuge and peace of mind in the monasteries during and after the zombie war. Primary location and name of Volume 3 in the comic book series “Le Décalogue” by French author Frank Giroud. The Call of Duty: Modern Warfare 3 DLC Map “Sanctuary” is set in the monasteries of the Meteora. The 2003 album by Linkin Park takes its name from the site. The monasteries were a filming location for the 1976 action movie Sky Riders  starring Susannah York, James Coburn and Robert Culp. In The Young Indiana Jones Chronicles episode “Travels with Father”, Indiana and his father visit Meteor.